...from the dashboard, replacing them with two extra digital displays. Smart will show an evolved version of its Forease concept at next month's Geneva motor show. Previewed in a new sketch, the Forease+ concept car receives a roof and revises the styling of the Forease electric open-top two-seater shown at last year's Paris motor show to mark the brand's 20th anniversary. The machine is based on the Smart EQ Fortwo cabrio, and is intended as an “uncomplicated solution to urban mobility”. The Forease is marked out by a shorter windscreen, with two ‘domes’ behind the seats for safety in the event of an accident. 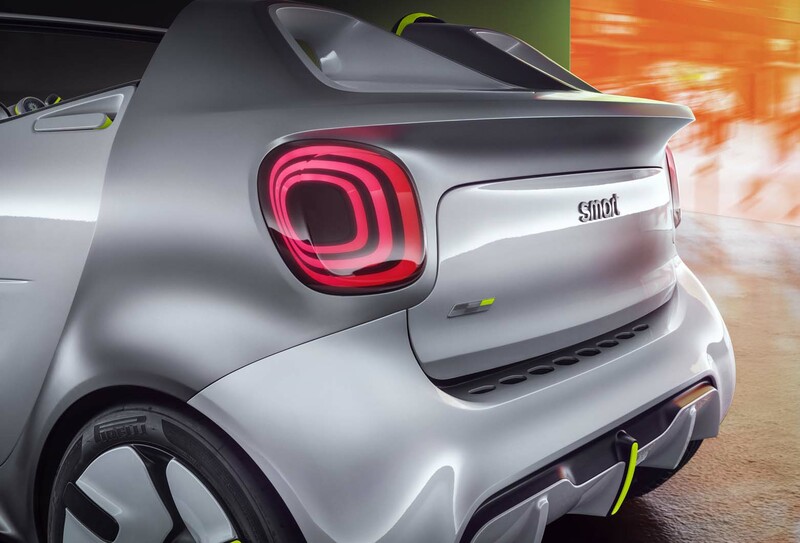 According to Smart, the Forease+ concept will be "as reduced and dynamic as its predecessor smart forease. The smart forease+ offers a “plus” for all weather conditions of urban metropolises". The original Forease on display in Paris was finished in white with ‘stream green’ colour accents, also used to denote particular interior features. Because the car was permanently open to the elements, Smart removed the air vents from the dashboard, replacing them with two extra digital displays. These can be used to show content from a related smartphone app. “The Forease embodies a refreshingly simple form of driving fun in the city, standing for urban electric mobility without compromise,” said new Smart boss Kartin Adt. The EV powertrain is a nod to the future direction of Smart, which will become an electric-only brand in Europe from next year. It has sold only EVs in the US, Canada and Norway since 2017. The Forease echoes two previous Smart concept cars: the Crossblade and Forspeed. The 2002 Crossblade was a minimalist machine with no doors, roof or windscreen. Although it was conceived as a show car, it was put into limited production following a positive reception, with 2000 units produced. The Forspeed, shown in 2011, was another open-top concept that previewed Smart’s electric drive system. As with the Crossblade, it also featured a wind deflector – shaped to mimic an aircraft propeller – in place of a windscreen. Four...e’? bit like Fork handles, Candles?, it’s an unusual name, don’t we think? No Peter Captain Obvious Spam Your Name Everywhere Cavellini, It's not like Fork Handles at all. ... a successor to the Suzuki XC90. Just wish Smart would stop faffing about and reintroduce the Smart Roadster / Coupe from a few years back. The time is surely just right for it, maybe even an EV version? It won't ever go into production. I would say this is a nod to the facelifted version of the fortwo/forfour. Presumably this may offer a better range in EQ versions, which at present are alarmingly low. It may be my only option since three door cars are almost extinct, new, and the ForTwo version is ideal since I would never, ever, be expected to ferry people about. The only downside of the petrol ForTwo is that it now costs £140 to tax. Takes me right back to the 1990's when the PLG rates for cars really discriminated against drivers of small, sensible cars.